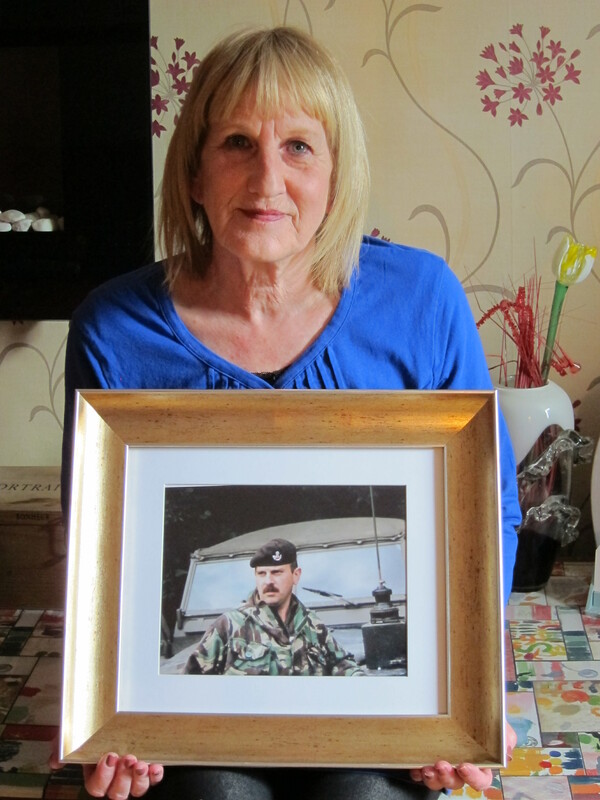 Wendy Hutchinson was born in Kent and met her husband Tony in 1987, when he was a serving in the British Army. Wendy talks about their busy family life with seven children and details how Tony left the Army in 1992. She describes Tony’s experience of Post- Traumatic Stress Disorder, and outlines the lack of support Tony and Wendy received before Tony’s death by suicide in 2015. This interview was conducted by Ailbhe McDaid on 28 April 2017. It’s the 28th April 2017. Conducting an interview for the War Widows’ Stories project with Wendy Hutchinson with project representative Ailbhe McDaid. For the record, can you state your name please? And your place of birth? That’s great. Thanks, Wendy. Maybe we can begin by you telling us a little bit about your life, where you grew up, those kinds of things? I was born in 1954 in Folkestone, Kent. I grew up there and lived there until I was about 18. My father worked for the Army, and after he came out of the Army, after the war, he was an engineer. So he worked civilian life because Shorncliffe Camp is near where we lived, which is an Army base. Yes, I had two sisters, two brothers, but my mother didn’t have me until she was 39, so my oldest sister was married and had a baby before I was born. So yes, normal life. We weren’t rich, but we had what we had. And did you go to school in Kent? Yes. I went to a little school near where we lived, and then I went on to Harcourt Girls’ School because they had separate schools, then, girls and for boys. And then I stayed there until I finished, and then I went to work. Can you tell us a little bit about your working life? I started work in Woolworths, and then I moved on to a factory, Carter Wallace, that made Pearl Drops and deodorant, and I worked there. I was made supervisor, so I was in charge of quite a few girls, women. Until I met my first husband. Well I met him when I was 14 because he was in junior leaders, but we never got back again in touch with each other until I was 18, 20. And then we got married, and I had a son and a daughter. He was from Scotland, so we moved back near Gretna Green for about a year, and then we moved back to Folkestone when my father died. It was about eight years or something, and then we fell apart and split up, so I had my son and my daughter on my own, and then I met Tony in 1987. He was in the Army, he’d split up from his wife, and he had four children. We came to Wakefield because he was working at the time for the TA [Territorial Army, now Army Reserve] because he had the children to look after, and we got married on 1st April 1989. And then we had a son between us, so that made seven children. So, it was quite a busy life, and I’m not keen on children, but I didn’t go anywhere, on any postings or anything with him. Well we moved to Tidworth, and then we moved to Warminster, with the seven children. He was in the School of Infantry, teaching signals. It made me laugh because when we moved to Warminster we then said we have to have a five-bedroomed house, and they didn’t have any, and they were doing up some houses in the road, the Army, and they said, “Well, you can have two of them”. And what made us laugh: they said “Well, we’ll try to have them next door to each other”. So my husband said, “We can’t have the children down the road having a party while we’re sat here”. So we picked out two and they put a door in between, and we had a two-bedroom and three-bedroom house with the seven children. So it was quite hectic. He’d done about nine tours of Ireland in his career. He was in Germany for quite a few years. With his first marriage, he got posted to Gibraltar, so they had two years there, and then it split up when he was back in Germany then. But he did nine tours of Ireland and he was starting to get ill then. That was about 1980 … 1990. He collapsed, and he thought he was dying, but they put that down to stress. He just said “I can’t do it anymore. I can’t do it anymore. I’ve got to get out”, and they said, “But you’re not well”. But he wanted to get out, so he left in 1992. He left the Army in 1992? Yeah, he couldn’t stick it anymore. At the time we didn’t realise, I think it might have done him good to stay in, so they could put him in hospital, but at the time he just couldn’t take it, so he left in 1992. What kind of supports were made available, if any, during that time? Before he left, or when he left? During the process of leaving and subsequently? Well, he collapsed and he thought he was dying of a heart attack, and they said it was stress. I think it was mainly because he did his last posting in Ireland in 1989, I think it was, and he was in a very stressful job then, directing the helicopters and all that. And I think it was just building and building, but we didn’t realise at the time. So he didn’t get any support then, I think that was because he was adamant he was coming out. The doctor who was examining him, he said, “Well, I’ll put down (because you won’t stay in because he was just ready for walking away) … We’ll put down that you’re A-OK, but I’m not happy”. But he wouldn’t have it. So, they didn’t give him any support then, and then he left, and then we came back to Wakefield, and that’s when it all started building up. We came back to Wakefield. He wasn’t well at all. He did a course on being a domestic appliance repairer, which he did. He was quite good that way; could do anything. But it just started going wrong. He just kept collapsing, and the terror, and all … well, he wouldn’t talk about. Or he’d want me to lock him outside because he was scared he would hurt me. And my son, the youngest then, was only five, six, seven … something like that. And the other children were all grown up, and so most of them had moved away, so it was just really us and the youngest one at home. So, it started then, but we weren’t sure what it was. The doctor put him through the mental health thing to see what it was, and he couldn’t work out what it was. But he was drinking as well and I thought it was something to do with the drinking. When he was feeling funny, he drunk more. I could see a pattern. But he still tried to work because, well, he’d worked all his life. Because he joined when he was fourteen, 197—, so he did 22 years in service. So he tried working, but he’d be phoning me up saying, “Come here, come here”, cause it was mainly washing machines, and he’d say I’m scared I’m going to hurt them, so I used have to drive out and sit outside, so we knew something seriously was going on. We went into the mainstream mental health [system], and they said right we’ll let you talk to a psychologist. Have I gone too far? A psychologist. So he said yes. Of course, that was the worst mistake of his life because she started talking about childhood, saying something has happened to you when you were a child, and he was believing it, and I said, “Well, that’s not right because he’s got two sisters, three sisters, who live round here, because he was from Castleford and that’s why we came back here”. I said, “That’s not right”, because he couldn’t understand what was happening, and she was putting it all onto his childhood. And it was just getting worse and worse, and then he collapsed. I can’t remember whether the doctor or whether the psychiatrist said something about Combat Stress, so we were putting two and two together, and I was saying, “I think it might be something to do with your Army life”. So, we got in touch with them, and they were very helpful. And they sent him to Alderley Court, which was for injured soldiers, and they, there at Alderley Court, diagnosed him and they said, “You’ve got Post Traumatic Stress Disorder”. And that must have been about 1993 or ‘94 before someone actually said what you’ve got. So that’s what we knew we were dealing with. Could you just maybe talk a little bit more about how you accessed the services of the Army for the diagnosis and then the subsequent experience? Well, as I say, we were going through the ordinary mental health [service], you know the National Health [Service], and we couldn’t work out what it was. I knew it was something to do with the Army because he wouldn’t talk a lot about his Army, and he was having dreams about the house getting blown up, not with him there, but with his family, and he couldn’t take the noise of the children coming. They started having grandchildren, you know, a little baby, and he couldn’t take that noise, and I couldn’t work out … And no one actually said then it could be to do with the Army, especially not the mental health thing. I mean, they might not have known about that then. I don’t know, but no one said. And then he kept collapsing, and I can’t remember who it was, whether it was the doctor who he was seeing, the local GP or … I think it was the GP. I don’t think it was the mental health [professional] who was seeing him. He said, because he talked to Tony, he said, “Well what about finding out”, and he must have heard about Combat Stress. I don’t know whether he wrote to them, or he told us to do it and then they got in touch with him. So, it was more like the GP, this old GP we had who was quite good. So, they did get in touch with us, Combat Stress then, and I can’t remember if they came out, but something happened because they said, “What about having a stay at Alderley Court?”, which he did. So that was the first actual military connection that we made because it’s hard to work out what it is. Afterwards, yes, but not at the time. So he went there. I run him there and picked him up and brought him home. So he had two weeks there and he’d come home and he knew what was wrong with him. Talking to other men, as well, same symptoms. And he knew, he said, “That’s what’s wrong with me,” and I think he was embarrassed about it to be honest because men don’t like to think that there’s a weakness, you know, because he did quite good jobs in the Army, and he got up to Colour Sergeant so there wasn’t, … So I think there was embarrassment about it. So that was the initial diagnosis and the first stay. Can you talk a little bit about after the diagnosis? How did things progress? Well, that was, say, 1994. I can’t remember exactly. He tried working for himself, because I said to him, “Instead of working for a company, if you work for yourself, if you’re not well, you haven’t got to go in”, so we tried that, but he couldn’t even do that. I mean, he’d go to job and if there was a man working on the roof, he’d think that they were watching him. So he’d go, with his toolboxes, go around the back, and I mean we used to laugh. You still always got the laughter with military men. They would laugh about anything. And he climbed over the wall with his toolbox. She didn’t even have a gate and he knocked on her back door, and she opened it. He’d gone over the back. It’s weird because he knew what he was doing, but he couldn’t stop it. It was still in his head that he was being watched. And in the end, he just couldn’t keep it up. It was just … collapsing, and building up, gradually building up. During that time, did he receive a disability allowance? No. Then, when he’d stopped working, I said, “Well, you can’t stop working”. I said, “Let’s put in for a living disability allowance. We had a mortgage and everything then. I tried working, but every time I’d get a job, he’d get ill, and he’d be phoning me up in tears, and I was having to leave. And I said, “It’s not fair that I’m not working. I should be working and not keep running home”. And I think my son was noticing it more. He was only six or seven, you know, and he was noticing it more. I had a daughter nip round, she still does. It was my daughter, not Tony’s, because his daughters were living in Scotland with his ex-wife, near his ex-wife. But she said there’s something going on, something not right. And I said, “Well you’re going to have to go on benefits”, and that broke his heart the most. And I said, “You’re going to have to. We can’t survive without it”. So we went for living disability allowance, and we got that, but it was a low rate, and I said, “No, it’s not right, Tony. You’re seriously ill”. So we fought for that, went in, and they said yes. We had an appeal, and they said yes, the higher rate. And I don’t know if it was someone from Alderley Court, another patient, who said to Tony, “You should get a war pension for this, so I looked it up, and we put in a claim, which started at 30%, but it was just getting worse and worse, and I said, “Well, no, we’re not making it up. I’m not having it”, so we put in, and they put it up to 70%. By this time, Tony was drinking more, and I could see it. I used to say to him, “Oh, your head is playing you up”, and he wouldn’t tell you about a lot of things. I know he did sob about one where he was a young soldier who was on the helicopter with him, and he’d been shot and his brains were hanging out, and he was trying to hold them in and the officer who was with him said, “Leave it. He’s dead more or less”, and Tony wouldn’t leave it because the young lad was still breathing a bit, so they had to [unclear] then, and I think he couldn’t get over that as well. So, we fought for the war pension, and we appealed that and had to go through the appealing, and that used to make me cross because soldiers, ex-soldiers, sailors, ex-military, they have pride, and he hated being on benefits. And I thought you shouldn’t have to fight for it. His drinking was getting worse, and he was drinking more and more when his head was playing him up, and I thought that’s connected. No one told us that alcohol could be connected to post-traumatic stress. I said, “No, Tony, it’s something to do with your drinking”, but he wouldn’t stop. He had a few more trips to Alderley Court because he enjoyed it. But the only thing was, which I felt they did wrong, was because he was having alcohol, and it was coming up in his medical notes, because he would talk to the doctors, you know, he was drinking quite a lot to cope with it. So they said you can’t have a drink there, which is fine, but then you’ve got other soldiers there, who, because it wasn’t in their medical notes, they could go out and get drunk. Tony never got paralytic or anything. He was just drinking, and it was never vicious. It was just the drink controlling him, to help him. He couldn’t accept that. That half of them could drink and half of them … He said that no one should drink. So I think he used to go out, and of course they said, “No, you can’t stay if you’re going to drink”, which was fair enough. So they stopped having him there unless he could stop drinking altogether. You’re talking about this going on for about eight years, so it was getting intense. He was alcoholic by then. I knew he was. So in the process of him not being able to go back to the residential, were there any other services put in place at that time? No, not that I know of. And then, of course, Combat Stress, they’d come out every now and then. And then – I can’t remember the man – he was leaving, and then we never saw anybody after that, so there was a big gap between who’d see how he was getting on. And I used to say to him, you know, over the years, “You should get in touch”, but he’d say, “No, they’ve got young men coming up. I don’t think there’s anything they can do for me”. But it was getting steady worse and worse. And it was a hard life. I think I would have left a few times. If I’d left, I knew he would have been dead. So, it was a hard life. And it was a hard life for his family because they’d come and visit but he wouldn’t want to … the noise, the children and that. Because he looked after them when their first marriage split up. They had contact with their mother after, you know. And he was a very nice personality man, very caring, so it must have affected them a lot because they were moaning, “Oh, he’s drinking”, and all this and that, and they were pulling back a bit, but like I said to him, it wasn’t his fault at the time, I could see it. It was to do with his illness, but of course he didn’t want them all around him. It was just me and my youngest, Mark. But that’s another story because I think the shock he had with his father really affected him. So when he was fourteen they diagnosed him with schizophrenia. So I had Mark and I had Tony. So it was a fun house. Very difficult for you then? Yeah. There was always humour with Tony. He never lost his black sense of humour. And I made sure every October … They had a signals reunion in Doncaster, so I used to take him, and we’d go there, and he’d meet all his old friends. Because he was a very loveable character, and he had hundreds of friends, everybody knew him. Even the officers knew him. I used to make sure he got there because he used to love talking to everyone, but that was it really. That was all he had. Did you or he have contact with other ex-service men and women? Only that, only the reunions. Only the people that he knew close. Only the reunions what I used to take him to. All we knew at the time was Alderley Court. We didn’t know anything else that there. Whether there was, we didn’t know. He was gradually getting worse, and he was falling over a lot. He wasn’t drunk, but he was on a lot of medication because we were seeing the ordinary mental health [service], who were a waste of time, but we were seeing them, and he was on a lot of medication to try to do the anxiety and the depression. So he had a few falls over the years. He broke both hips, his back. He had a wedge fracture, so he lost five inches in height. But when he’d done that, we took him into A&E and the doctor said no, because he’d only picked something up, and the doctor said, “No, it’s just your muscle”, and didn’t even bother with an x-ray. Nowadays I would have said, “I want it done”, but they didn’t. By then his other health was going down. His liver, because of the drinking and all that. He never drunk shorts, it was just beer. We found out after that he’d had wedge fractures and his spine was all bent. So by now, this is going over the years. I’ve had him in and out of hospital mental-wise, and he died aged 59, and I’d say he looked about 89. All we had was the war pension, living disability allowance, and then I said to him … I can’t remember, three or four years ago … about three years before he died or two years … I said to him, “Your alcohol is to do …”. Because I used to go on the internet and have a look, you know, about post-traumatic stress disorder because they never really give you any … the family … they tend to … It’s more to do with him. They don’t say to me, “Well this is what you’re going to expect”. I had to learn it myself over a good few years what it was. And in the mental health [service] they took no notice of me whatsoever. One time we had an appointment with a psychiatrist, and he asked Tony how he was doing, and Tony was a bit depressed, so I tried to say, and he said to me, “I’m not interested in what you’ve got to say, I want to talk to him”. And, of course, he [Tony] lost his temper, he said, “You wouldn’t know anything if it wasn’t for my wife. I wouldn’t talk about anything. You wouldn’t know anything”. So you’d get no support for families. You still don’t, I don’t think. So it was a learning curve, but I used to look on the internet and say alcohol seems to be playing a lot on your illness, and there were a lot of other service people who were, you know, getting drunk or ending in the gutter. So we put in for his war pension. We said, “No, he’s getting worse. We’re putting in for higher [rates]”. And we had to appeal because they said “No”, and then we went for the appeal and they accepted it was alcohol dependency because of post-traumatic stress, but we had to fight to get it, and it used to make me mad because I said, “We’re not lying”. Because if you’d said to Tony, “We’ll take all your benefits away and take any of the thoughts in your head, and you’d be a dustman”, he’d be there. And that’s the trouble, you see. In the end, before he died, he was up to 100% war pension because he was that bad. But we had all the ups and … But there’s such a lot. You could sit here for hours talking about over the years. It’s a terrible, terrible … And the trouble is because it’s mental. If he’d had his legs blown off or his arms, they would have said, “Oh …”, you know, but because it’s mental, they didn’t see it. I still remember when I went to his inquest, and I’ll come back to that, you see … But when they did a thing on it, they looked into it, to how he was allowed, in my eyes, just to die, so they looked into that. The first bit of this report I saw and it said “a 59-year-old unemployed man”, and that annoyed me because he was not an unemployed man. My husband did 22 years, he was not unemployed. And he [the coroner] accepted that, and he changed it. But when I went for the inquest, it was still that old bit, and when I said it to the inquest coroner, he didn’t want to know. But I thought, no, it’s not right because you wouldn’t say if a soldier were lying in bed with no arms and legs, “a 39-year-old unemployed man”, would you? Because it’s mental, “unemployed man”. And I thought, all he put up with over the years, and he’s classed as an unemployed man. But no, he didn’t get any real help. And the mental health [service] … Well, I don’t know about other areas, but Wakefield, West Yorkshire, is disgusting. I had to look things up and try and find things. We managed to plod on. And then 2012 … 2013, so we had no contact from Combat Stress, we only had the war pension, we had no support from anywhere else. I mean, he was getting 100% war pension, which was enough. I had him and I had my son, who is 28 now, and he is mentally ill as well. So I was caring for both of them, and of course when my husband got worse, my son would be worrying about him, so he’d get worse, so I had both of them, but you only get one carer’s allowance. They don’t give you two, they only give you one. You’re entitled to it, but you only get one. So I couldn’t’ work, of course. I had the two of them. So did you work outside the home during your marriage? Well I did try. When we were married and we had seven children I went out. I’d try anything, me: restaurant, waitress. You need money, you’ve got to go work for it. That’s the way it is. My children and his children were all like that, except for my poor son, who would love to work. He wanted to join the Army of course, but he can’t, not with mental illness like that. But they’ve all worked, and that’s the way it is. So I did try to work but I’d have to keep leaving jobs and I thought it’s not fair. You start work somewhere and then you’ve got to … And then as he got worse, and then my son starting to get … because I thought it was just a depression over his father, but it started coming out now he’s something else coming out. But I think it was the shock of seeing his father like that that brought it first out. So I couldn’t work. I was stuck here with the both of them. My husband was still drinking and because he wasn’t working, I wouldn’t let him have any alcohol in the house, but he’d just sit here, and we’re talking near the end now, when the post-traumatic stress was really … in about 2012 … so, I’d had it all that time up to then. He was steadily getting worse, and it was a constant battle to stop him drinking. And in the end, you know, it pushes you down. I used to take him to the pub … because he was that physically … he couldn’t drive or anything. I would take him to the pub, leave him for two hours and pick him up, so at least he was getting out, and then bring him back, and then have no drink in the house. I mean, even at night I used to have to get up with him because I didn’t know, because he’d have falls or he’d switch the cooker on and didn’t know he was doing it, you know. He couldn’t sleep. Sometimes I’d be sitting there dying to go to bed, but I’d have to see if I could get him. And his tablets, I had to have them in a safe because he would keep taking his sleeping tablets, trying to get himself out of what he was thinking. So my whole life was stuck around him. And in , he just started getting worse and worse, and he was talking about, really, suicide then. But we ere just with the ordinary mental health [service]. Every outpatient appointment. Every couple of months you might see the psychiatrist. I used take him every time, every appointment I took him, even if he didn’t want to go because I said, “If you lose contact, Tony, how the hell are we going to get you any help?” So I used to take him and that. But the trouble was he’d see a psychiatrist for two visits, and then the next time it’d be a different one. And then he’d got to go through all … And Tony, he wouldn’t like talking about it, in the Army and that. He might talk and laugh with his friends, but he wouldn’t talk about it because I could see it would start coming up. And then they’d want to know the beginning, so he’d have to start again and that. In the end, he was on that many tablets. And they’d say “Well, we’ll take these off and we’ll try them”, and I’d say to them, “You’re doing that, and I’m looking after him while he’s going off his head. You know. If you’re going to try and change different tablets, can you not have him admitted?” “No, no, care in the home”. I said, “Yeah, you mean ‘get on with it’”. He got his tablets, but they were not controlling it, they were keeping him down. So that was it, just outpatients’ appointment. And then he was really talking about suicide in 2012. I think it was in 2012 or 2013, he did really lose control. I used to have to put his tablets away, lock them up, because he’d take them all, but then he was losing … really going downhill, and I tried to get him some help mentally, but I couldn’t. Because they were moving all the mental health around, he was under some other area, but he was still having outpatients at local area. It was a hard job trying to find out who was supposed to be looking after him. And this was all NHS? No military help? Yeah. We had no other help whatsoever. We didn’t know of any. Only Combat Stress. But then we thought because the one who used to see Tony had left, we ere seeing no-one visiting, and Tony said, “Well they’re getting a lot of young ones coming up now. We won’t bother them because they’ve got enough on”. And I thought, well that’s right, they only have so many staff. What can you do? So, it was just mental health [services], and it was me having to constantly fight to get anything. In 2013 he really lost his mind, and I could tell that because usually I could control him because we’d have a row, and he would listen, or I could calm him down, but there was just nothing there, just nothing. So I tried to get him some mental health help. He had no psychiatrist nurse seeing him. Mark I was trying to get changed over to adult’s one, so I was more worried about my son. He had no mental health nurse. He was only an outpatient, and I think they just thought at the time that he was an alcoholic because he had alcohol dependency, and they just thought wino. He was really going down then. He lost four inches in height. I got him a shed. In Wakefield, there was a mental health hospital here and a charity, it must have a trust, who gave the land to mental health. Every year they put in the paper, we’re going to put out some money, from the interest, for any mental health people, if you put in a bid, you could get some help. And I thought, what if I got him a shed and some tools for woodwork because at the beginning of his mental illness, he went to do woodwork, and it was something to fix on. So I put in for that, and they were helpful. They gave me all the money, and I got all the shed done, but of course then his spine went, so he couldn’t go in there, but I kept it all locked up. Well in 2012 his head was really going. He wasn’t drinking more because I was controlling him by then. I was taking him and bringing him back, and it was arguments all the time about wanting … So I was still controlling what he was drinking. He wouldn’t stop, and I knew that. But one night he must have crept up, and I could hear some scraping noise. He was trying to get into the shed because he had to get a chair because he couldn’t reach it to get some electric tools to cut his hands off. So, I get the ambulance out, they take him into A&E, and he’d be there and then the mental health would come out, and I said, “He’s not coming home”. And I think he [the mental health worker] was from Pontefract, he was supposed to be under them, a different area, I don’t know. Anyway, I said, “He’s not coming home. He needs a psychiatrist”. Well at the local hospital, Pinderfields then, what they did was they worked on you physically. When they’ve sorted that out, they worked on the mental bit. But he needed it both together. And I had to say he wasn’t coming home, and I could see them looking at me thinking, “Oh you just want a rest”. I knew what it was. I said, “He isn’t coming home. He needs to be admitted to hospital”, and he was asking to be admitted to a mental hospital. “No, no, we don’t do that anymore”. So I said, “He’s not coming home”, and they wanted to send him home. “No, no”. So he moved into a ward and I went in there, and he was quite poorly then. And they said, “We’ve got a crisis team, from the hospital mental health. If you need us, we’ll be there”. And I said, “I give up. Alright, I’ll take him home”. So I took him home, and then from where he was supposed to be with, Pontefract, they phoned up and said. “Would you like respite?” And I thought, “That’s all you think I want is respite. I’ve got another son up there, you know”. But then I thought, if I get respite and they put him in a home, they can see I’m not making it up, that he’s going … . Yeah, yeah, I’ll have respite. She said, “Well, pack a bag”, she said, “and put all his tablets in”. So I did that. “And someone will come ‘round and take him and let you have respite for a week”. And I thought, if he gets in a home, they’re going to see there’s something seriously wrong with this man. So, I had it all packed there, and he was waiting, and then Social Services came ‘round and said, “Sorry, we can’t get you in at the moment”. So, … It wasn’t so much about the respite, but that I wanted someone to see he’s not well. He went to bed, I got him to bed, and then … I can’t remember .. because he’d already gone back in in the middle of the night one night to the A&E, and when they take him in the A&E, they like a medication, so I said to him, going in, because I thought if I keep going in there, I keep shouting them round, I thought I’m spoiling it for him, I want them to see. You know what I mean? You shouldn’t have to fight. He went in one night, this is in between, with his medication in the ambulance, and crisis team saw him in the hospital and said, “No, he’s alright”. And they sent him home with his medication. He came in a taxi, and I said, “Are you tired?”, and he said, “Yeah”. I said, “Sleep there”. And they didn’t tell me they sent tablets with him, so he took his tablets. I mean it could be made into a comedy, honestly. Anyway, he took an overdose when he wasn’t going to the respite because his tablets were out, and I’m worn out by then, and he took an overdose and is back in hospital again. I kept saying to them, “He’s not scared of pain. He will do it”. So he was in there for a little while because he took the overdose, and then they wanted to send him home again. I said, “He needs help. He’s not coming home”. I said, “He’s not coming home. I’m not having him home. He needs help”. You shouldn’t have to beg, should you, for mental health. The Sister phoned me up from the ward that had him on and said to me “Your husband is ready to come home”, and I said, “I told you he needs mental health [help]. I want a psychiatrist”. She said, “We don’t do that in here. This is an ordinary hospital. He’s coming home”. And I said, “He’s not coming home”, and I put the phone down. And he’s asking it for it himself, “I need help”. I went to the shop. This was during the day. I come back. I have to take my son with me because he won’t stay on his own. He’s scared of being on his own, so I have to drag him everywhere. I came back, and I get a phone call from this homeless shelter in Wakefield, saying: “We’ve got your husband sitting here”. I said, “What’s he doing there?” She said, “I don’t know, the ambulance dropped him off and left him”. And he was in his pyjamas and his dressing gown. She said, “The ambulance dropped him off because they said he had nowhere to go”. You couldn’t make it up. So, I get in the car, and he was sitting outside, talking to two young men. You could see they were druggies, hanging around the homeless shelter. They’d given him a fag because he’d talked to them and sitting out in his pyjamas and dressing gown. They said, “We don’t know why he’s here. Good job he’s got your phone number”. So the ambulance must have come to try to drop him off. I wasn’t here, and they just chucked him here. I’m not lying. So I bring him home. That night, I’d given him his sleeping tablets, gotten him to bed. I fell asleep, and I could hear the door going “bang bang”, you know that patio door. And as I come down, he’s sitting there with a carving knife, and he’s trying to carve his thumb off, and I said, “What are you doing?” And he’s tried to smash his finger off, and he said, “If I do it this way I’ll die quicker”. I get the ambulance out again. They take him in A&E, and they put him on the surgical ward because he’s cut right through, sawed it off. They patched him up, and then they wanted to send him home again. I said “I’m not having it. If you don’t do something about it, I’m going to the papers because this man is going to kill himself”. So they said, “We’ll have a meeting with the crisis team”. I came in at three o’clock to see him in the ward where he’d had his hand all patched up, and a woman from the crisis team was there, and I said “I’ve been told they’ve got a bed in Fielding, which is a mental …”. She said, “Don’t know who’s told you that. There’s no beds”. She said, “He’s going to have to come home”. I said, “No”. She said, “I promise you, we will help you”. I said “It’s in the night that he starts panicking”. “We will help you”. “You promise?” “Yes”. I got him home eight o’clock that night. He said, “I’m going to kill myself”. So I phoned them up and asked them to come out. So she said, “Phone the police”. I said, “I’m not phoning the police on my husband”. They sent out the police, and he was locked up all night in a cell. And in the end, even then, five o’clock in the morning, a psychiatrist nurse from the crisis team went to see him, and she said to me, “We’re bringing him home”, and I said “You’re not bringing him home. He needs help. He is not coming in this house. He is not coming home. Leave him there”. And, luckily, the psychiatrist who knew Tony – because he knew Mark as well, he had a couple of treatments seeing Tony – he phoned me up just after her and said, “What the hell has happened to Tony?”, and I told him. “Don’t worry, I’ll get him a bed”, and they got him in a private … because Fielding was full up … they got him in there. They still would have sent him home. And what post-traumatic stress needs, military, I don’t know about anybody else … They’re scared they’re going to hurt someone. They’re scared they won’t be able to stop themselves hurting someone. All they need when they’re going through a crisis is being somewhere secure where they feel safe. He was in there for two weeks, or a week and a half. It’s like a pressure cooker, and he started coming down. He came home again. And then it started again in 2015, no one would listen, and he killed himself. Exactly the same in 2015. But at least he is better off now, that’s the way I look at it. But we had no help, from mental health. In 2013 I got in touch with Combat Stress, when he did all that, and it said someone came out to see us from Combat Stress, and I said, “He needs intensive care”. “Well, you know he won’t be able to go to Alderley Court again because he is physically ill as well”. And I said, “Alright, fair enough, but there must be something you can do”. He said, “What about if you get onto the British Legion and have a break? Or there’s a good charity in Jersey, Holiday for Heroes. You can have a break with them”. And I said, “Ok”, and I wrote to them in 2013, and they gave us a week, was it, or two weeks, might be a week, in Jersey, all paid. We went to a hotel – I could take Mark as well because I couldn’t leave him – a hotel in Jersey and it opened my eyes because you’d see all these young soldiers there, and I’d think to myself, “My god, what are they going to go through?” Because my husband has had it for years. All people in Jersey, they put in the money. This couple started it on their farm. You can only go once. They’ve done families, they’ve done thousands, and it’s all from these people in Jersey. We had a lovely week. And did Tony have a good week as well? He had a lovely week, talking to soldiers and that. There were Irish soldiers there, there were younger ones, quite a few younger ones, and you could see they were going through the same with their mental health local area [services]. Some of them were even on tablets, Diazepam, which is very addictive, and it’s only like a little tranquilizer. And did you connect with any of the other wives or family members as well? Well yes. Oh yeah. One young bloke he didn’t bring his wife because they were splitting up because of his stress, and he said, “I wish I’d brought her for her to talk to you because you know you more than anyone. You know more than a doctor. You even know more than your husband because you’re coping with it”. Yeah, they were all like that. You’d sit in a room with them, and when we first got there we were given our room, and you sit in a lounge, and they pay out for all different hotels, and because Tony was a bit disabled so we got a disabled one. All over Jersey hotels that they put them up in. And you could see sitting in a room, I could pick them out, cause there was some older ones who were disabled, nothing got to do with military. And I said to Tony, “He’s got post-traumatic stress”. He’d pick up a book, and he’d try to read it, this man, and he’s going through it like that and then he starts again because nothing is going in. And this other one was up and down, up and down. What got me was these young blokes, I think, “Oh my god”. There was this one young man, big muscly. I don’t know if his was to do with the Falklands or maybe Iraq. He doesn’t go out, he said, because people start trying to fight, and he’s scared he’s going to hurt someone. Half of them aren’t on proper medication and they don’t want one. He said he just sees an ordinary doctor, they haven’t put him into mental health. All over the country this is, in Britain. So I thought I hope they don’t come to West Yorkshire. They haven’t got a hope in hell. None of those other families had any military support, as far as you knew? I don’t know about military support. There was one sailor man, with his wife, They were nice, and I think they had more support. I don’t know whether it was the Navy or whatever, but they had a bit. I mean, you don’t want to go too much into their personal life, only what they’ve talked. But they all had that … Even when they were ill and you could see that they were suffering … There was one para bloke, and he had to have someone with him, either a carer or a friend, and one para bloke, I’d say he was about 40, and his friend who was another ex-para, and he wasn’t well, and you could see them suffering, but they still had that sense of humour. They’d crack a joke with each other, and they connect like that, and I think it opens their eyes. These people, they hadn’t even been anywhere. Some of them weren’t even in the mental health team, and you could see them saying, “There’s other people like me”, because they can’t understand it. It helps them talking. They were brilliant, Jersey. You went out and didn’t pay going into [unclear]. They took us into an under tunnel and of course Tony was alright, but there was that young one, and I said to him, “You’ve got to go through it”, and there was like bombs going off. Anyhow, he ran through it, this young man, because of the bombs going off. But it was brilliant, and we had a lovely time. So they’re all out of the services now. So Combat Stress put you in touch with the Holidays for Heroes. Was there any follow-up after that then? No. We got a letter from Combat Stress saying we have to go through our local mental health now, and I thought we haven’t got a hope now, and that’s how he died in 2015. We hadn’t got a hope in hell then. We didn’t know about any outreach things. Wasn’t until after he died that I found out there was one in Hull, and then they were passing the buck. Mental health were passing the buck, saying it was the doctors who should have done it. I put complaints in, and they all come up with the same … . I emailed the government saying what was happening to ex-service, and they said well you’ve got that Military Covenant. And you know what they said, the National Health, they must have put someone in, because he died, they had to do an enquiry. And the man who’d come see me, he said their answer was Wakefield hadn’t signed up to it. Barnsley apparently had, so why didn’t they say to us we’ll let you go to Barnsley? Wakefield hadn’t signed up to it. No one told us. You’ve got to find out for yourself. Yeah. Well if the professionals are not saying to you, such and such, what help do you get? You’ve got to find out for yourself. Luckily, I had years of experience, but the poor young ones coming up. It doesn’t go away, that’s the problem, see. It doesn’t go away. It’s entrenched over the years, and it’s hard to shift it. It sounds like you had a very difficult time navigating all of the different services. Then in 2015, he was starting again. I wasn’t well and he went in twice in the middle of the night because he knew he was going to do something, and they just sent him home again. Then, Tuesday night, he went in, and they sent him back again, at twelve o’clock at night, I got him to bed, he was asleep. The next morning, I nipped to the shop because my sister lives near now, so I took her shopping, and I came back and he was sitting with loads of his tablets. He’d taken my son’s – my son is on very strong medication – so he’d taken my son’s. I got the ambulance, and he died a couple of days after. All his family came down. And then, even then, after he’d died, we wanted to bury him before Christmas, on 16th, all his Army mates, on his regiment webpage, there were hundreds of them saying, “Oh, I can’t believe he died”, and all this because he was a monkey, the things he got up to. And then the doctor hadn’t even written the letter out, so we had to cancel the funeral and got it again for the 23rd, and that was a struggle. I had to chase the doctor to write a letter. So we did it then. It was packed with all his Army mates. He had the Last Post and everything. And then after that I put in for my war widows’ [pension] because I wasn’t sure what money I was going to be getting, and the welfare of the War Pension Office. They came out, and she helped me a lot. Ok. Would you tell us a little bit about that maybe? Right. She came out, very good. I phoned them up and said he’d died and they said, “Right someone will come out and help you”. Of course, I had it ongoing trying to get him buried before Christmas. I didn’t want him lying in there over Christmas, so we had that, and then we couldn’t get him buried. But she helped me with that. We’d given our house up and everything because we couldn’t afford it, so that’s why we were in rented, you know, [accommodation] over the years. We were told we could have a couple of thousand to bury him because he was a war pensioner, which we got, and also because I was under retirement age when he died it was £2000 they gave me to bury him because I was under retirement age when he died. So I’d got £4,000 to bury him. So she was very helpful, phoned up the Welfare, and she would come, or someone would get back to me, and then help me sort it out because I’ve got the Army pension and all that. Because I’ve got him [Mark] dependent on us, which is only just me, so they sorted my money out. I mean, the War Widows’ [Pension] was £135 or £136, that was it, and I thought there’s no way I’m going to manage, but then because of his Army pension, because he did 22 years, they did that, and then I got extra because he died … like as they classed him … So I thought I well I could manage all that now with the money-wise. But I still couldn’t get a carer’s [allowance] for my son Mark because I was getting the War Widows’ [Pension]. It’s a joke, isn’t it? But the money, that side was a great help. Then I put a complaint in about how he died. But that side of it, welfare, that was a great help. What about emotional support? Nothing beyond that? Oh yes. His children came down from Scotland, his son came up through him dying, and that. So I had all the support there. There’s six of them, they’re all grown up, so I had the support there, and my daughter she was there. So I had the support there. We worked out the funeral, and one of his sons, Alan, he was coming down and phoning up the hospital to try to get this letter, and he was saying, “Get in touch with me. Don’t be upsetting Mother. She’s got enough”. I couldn’t fault the children. They all helped in their own way. And then we had the funeral. The support was there. It was Mark who needed more support, which he didn’t get because they were changing the mental health [service provision] around again, so they were shoving him somewhere else. He had a good support worker before they changed it. He saw someone in December, just after Tony died, I think it was, but then he was moved. No one’s been in touch with him asking how he’s coping with his father killing himself. So, I had to push because he’s in a new area. I had a kick off about that, and said, “Why hasn’t anyone seen him?” I know [it’s] because it’s changing around. Funny enough, his support worker, who was brilliant, she used to talk to Tony as well when she’d come to visit him. She said that she’s going on, and I think it’s because of what happened to Tony, she’s going on to learn about post-traumatic stress. Military. Which is completely different from civvies. Perhaps it might change in Wakefield because that old saying, “We’ve learnt by our mistakes”. But they never do. He’s had no support, so I’ve had to fight about that. So that consumes your life at the moment? Yeah. Tony’s gone, and I’ve got to worry about him [Mark] now. I know for a fact that he’s been talking about suicide. He said, “If anything happens to you, Mum, I’m going to kill myself”. His answer is, “Dad didn’t look in pain”. They need to sort out mental health [support]. Can you talk a little bit about how you joined the War Widows’ Association after Tony’s death? Yes, I had a look through the website, you know, just to see what was out there. And I thought, I can join [the] War Widows’ [Association]. He was proud of being in the Army. I wouldn’t wish anybody would go in the Army. I said to him plenty of times, you know, “I wish you were never in the Army”, and he said, “Well, if I saved one life (which he would have done, he’d have saved a few), it’s worth it”. I said, “What? This?” He said, “Yeah it’s worth it”. So I said I’d join the War Widows’ [Association]. Have you met any other war widows? No, I don’t think the area I’m in that they’ve got a [regional group] because I’ve looked through the book, and they haven’t. So I saw that. They send out the booklets and all that, so I saw that [advert] about this [project], and I said I’ll do that because widows, and families, you do a lot for your country, and they should remember that. And, of course, the men. But it doesn’t mean to say that a war widow is someone where he suddenly dies; it’s like a death that’s dragging out, and they should know that. There’s a lot more younger ones coming up now. Your experience of being a war widow has stretched over a number of years, even though Tony only died two years ago. Do you feel that your community recognises that? Did you feel like that over the years? So a quite isolating experience? Yeah, you are [isolated]. And because I was getting the Housing Benefit, they didn’t know what they were doing. They said, “We’re sorry”, in the Housing Benefit office, “We’ve never had a war widow before”. It’s not very well known. People don’t know that there are families, not just a widow, who are trying to carry on. It’s very quick. Very quick memory. Could you reflect on the effect of Tony’s illness and subsequent death on your own mental and physical wellbeing? I’m quite a strong person, but I suffered for years with depression, and that was all from Tony, and then, of course, with Mark coming up as well. My personality changed. I was a more happy-going person, and even the children noticed that, than what I have been for the past years. And now I don’t like a picture of Tony. I can’t look at him, so I’ve got that one there, and that’s the one my son has on his wall. But I think I’ve started to come to myself, but that’s not through any support. It’s not through anything … “We’re sorry what happened”. That’s just me. I don’t think the areas, wherever you live, think too much about what’s left behind. What a waste. I think it’s a waste. My husband, he’d say he’d do it again, but I think it’s a waste. But you don’t get the support [for] the families, especially the children. He changed in their eyes over the years. In the end, they didn’t really want to come and visit him. It’s your family, it changes. But that’s with a slow death. Quick death it’s all shock, and it must be horrible, but mine was a slow death, so completely different than someone actually getting shot, but it’s still the same. You’re not classed as that by the mental health [services]. Like in that report he’s “an unemployed man”. They wouldn’t dream of putting that down if he were lying in bed, like some poor soldier or sailor or a woman with no arms and no legs. They wouldn’t say she was an unemployed woman, 39 or 49-year-old. An injured soldier. Which he was. I think it’s probably been like that all through the years. You don’t have any sense of it improving over the years? Well, I suppose I probably get better than someone in the First World War or something. They didn’t have anything then. Words are so easy for the government. They’re so easy. I get enough money. That’s probably improved, which does help. I’d love to go to work. I’ve always loved to go to work, but I can’t do it now because of Mark. I couldn’t leave him. I’ve still got him, so it’s still ongoing. I always say his illness started because of his father, because he was so young, watching it. I don’t know. I think a lot of people think war widows are really old women, Second World War, and it’s not. It’s young women, young men. They can’t get out of the idea, Second World War. It’s so quickly in their mind gone again. Do you think the Army, or the military, could have provided you with different or better supports? I think it would have been nice at his service … and I know his was a long death … but that his regiment could have personally gotten in touch. Privately he had hundreds of friends, and I could phone up one of them and they would help, but maybe the regiment saying, well, “I’m sorry”, and maybe saying, “Would you like to go to a Remembrance Sunday, and I will come and take you”. Instead of me having to try and do that. I’d only do it for him. I may be biased, but I feel that this country doesn’t deserve men like him. But I would do it for him, but you think that maybe if they’d do it … He’s gone, but there are his children, his grandchildren. Some of them still having them now, that will never know him. And he was a great bloke. All the early memories of his children are wiped out by the older memories where he wasn’t right. That’s the only thing, it’s still ongoing for the families. He might have died but it’s still ongoing. Do you have a number of grandchildren now? Between us, we have fourteen or fifteen, and still going. The older ones know Tony, but not like they should do, because he couldn’t take the noise. You mentioned support from the family around the time of the funeral and in the immediate aftermath of Tony’s death. Is that ongoing? Yes, my daughter, she came with me to the war memorial. She’s got her own life, she’s got children, but yeah, it’s there. My stepson, Alan, who is in Scotland. Because Mark only had his father, he’s got no one else. It’s only me, so he’ll come shopping with me, and come walking around. Anyway, he phones Mark every day without fail, talks to him, and Sharon will take him out. And Alan and Tony’s daughters, when he died, they’ve stayed, so I have that support there. Well I brought them up anyway. They were young. Well, a couple of them were. But that’s the main thing, Mark getting the support. How do you think your life will progress now? Do you think being a war widow will be part of your identity? Yeah. I feel though my husband has died and he’s done his part for his country I’d like people to realise that war widows are ongoing. It doesn’t just stop. You are a war widow forever, and if it’s sudden, which is horrendous, or if it’s slow, which is horrendous, you’re still a war widow, so it doesn’t stop. So, I think it needs to be a bit more aware that there are a lot more younger war widows coming up, and they need the support. I think half of it is just being recognised. Yes, I’ve done years of looking after someone with post-traumatic stress. You’ve done good. But even if your husband got shot and dropped down dead. Yeah, we understand that you’ve given a lot for this country. It’s not just the man or woman who died. It’s the family who’ve given a lot for the country. You don’t get that recognised. The government needs to say, “Look what they’ve given. Look what they’re continuously giving”. Even the grandchildren, what they’re giving, they’ll never know him. Instead of just [being] forgotten about. Recognise that it goes on forever? You were saying you put in for the child allowance? Yes, I put in for the child allowance because he’s relying on me. He’ll never work. He wants to, but he’ll never work. It just gets worse. I think it’s got worse since his father died. It’s his friend, “My mate, my best mate, my only mate”. He’s got no other friend, except for his brother. They said, “Yes, you qualified for the war widows extended benefit, and we’re pleased to tell you, you get a pound a week”. For Mark. I thought that’s probably because you get sickness benefit. I phoned up and said, “A pound? !” I got offered that in my first divorce in my daughter and son’s maintenance, a pound for them. I phoned them up and said, “What’s this pound for?” And she said, “Oh, it’s always been a pound”. It’s probably been a pound since the First World War. She said, “It’s always been a pound”. Probably for the adolescents. I don’t know about the little ones. She said, “It’s always been a pound since I worked here”, and she sounded quite old. I thought that was a joke! Was there anything else you wanted to talk about? No, I’ve gone ‘round about a bit. No it was wonderful and thank you so much.